Whether you call it chocolate fridge cake or tiffin, there is nothing easier really than a no-bake treat which you can whip up in no time. 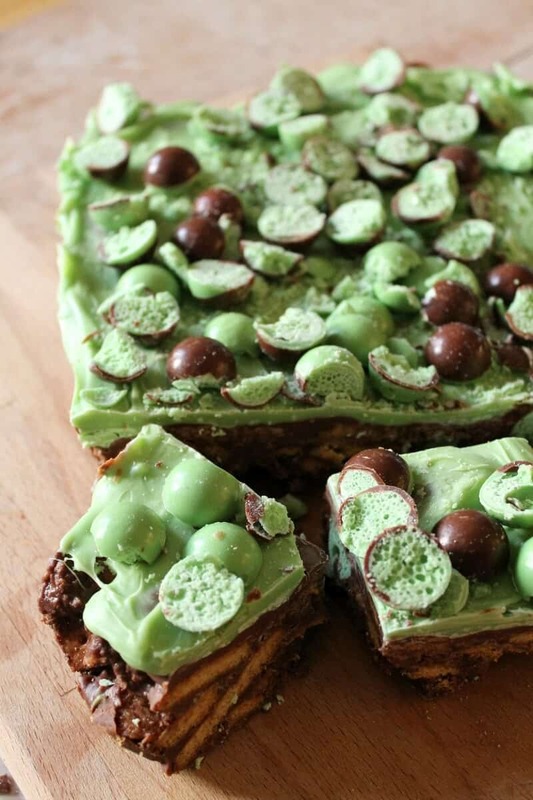 Mint aero chocolate fridge cake has to rate alongside those good old no-bake favourites Mars Bar slice or rice krispie bars for me, with the added bonus of including my favourite mint chocolate treat! No-bake slices like this really remind me of childhood and eating tiffin with fruit and nuts alongside the biscuits I think. 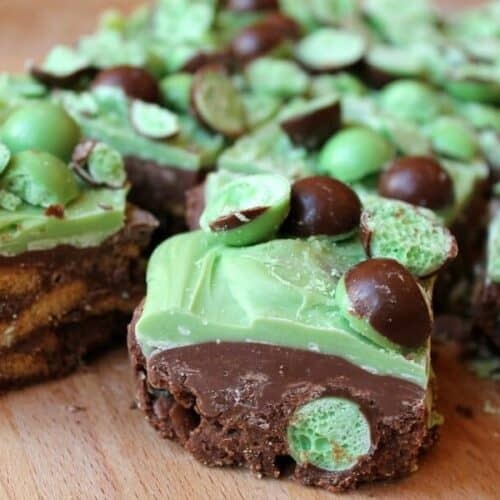 It is so easy to make, just melt together your chocolate and golden syrup, then add crushed biscuits and Mint Aero bubbles, cover it all with more chocolate and chill it in the fridge. I tend to use the microwave to melt my ingredients as it is so quick and easy and makes the whole process even faster! 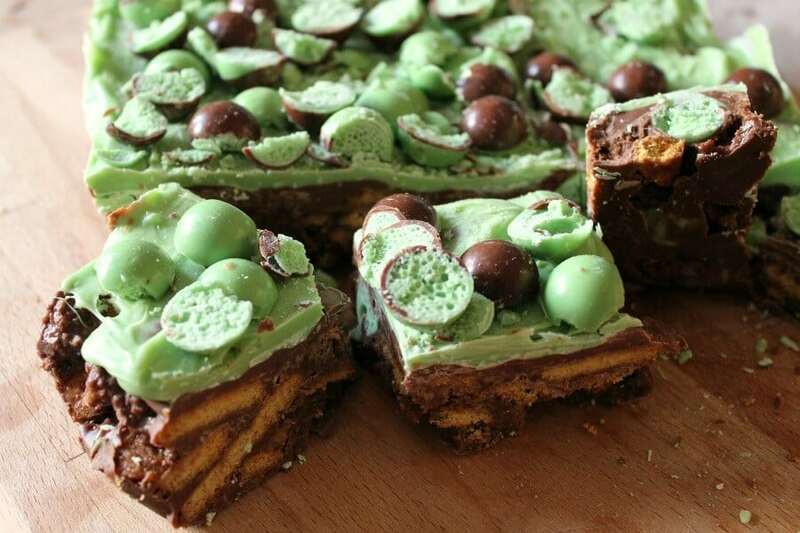 To top my mint aero chocolate fridge cake I have used a layer of green candy melts, and then covered the top with halved Aero bubbles, but you would swear as you eat it that it is mint chocolate as well. It must be trickery from the flavour of the Aero. 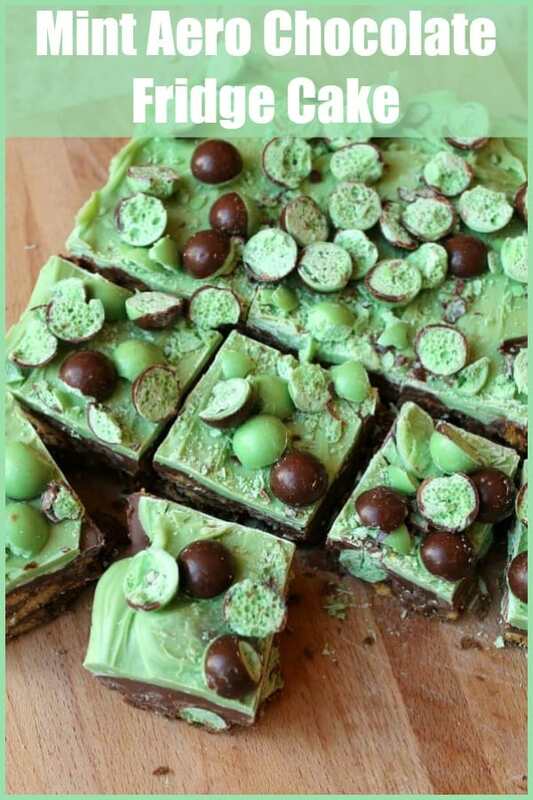 The colour matches the Mint Aero bubbles perfectly and being so easy to melt (candy melts don’t seize) it is a great and simple way to finish off a traybake. 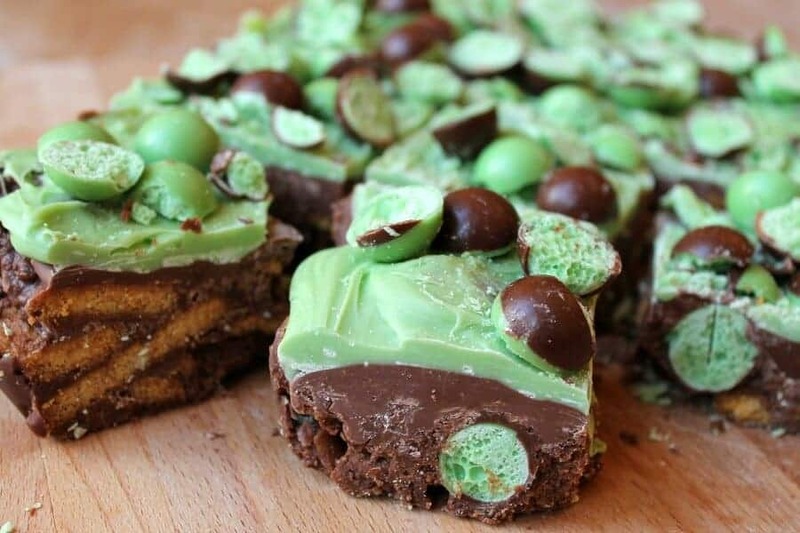 What with being so easy to make, mint aero chocolate fridge cake is perfect for bake sales, a spot of weekend baking or whatever occasion you feel would best be served by a rich chocolate treat. For me that could just be a Monday afternoon!! 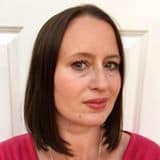 If you’ve read my blog before you’ll have seen my love of Mint Aero bubbles I am sure – my most popular post ever which went viral a few years ago was my slow cooker mint aero bubble chocolate cake. There is something about bubbly mint chocolate that you just can’t beat! I just love the Aero bubbles inside the chocolate and biscuit layer, their green colour just peeks out when you slice in. Minty treats through and through! Tip! When slicing this traybake up, it is best leave it out of the fridge for a few minutes to soften, then use a large kitchen knife to slice into pieces. It is so easy to make I made a quick video to show you how simple it is to whip one up. Check it out in the recipe card below. Line a tin 20 cm x 30 cm with baking paper. Place 250 g of the milk chocolate in a bowl with the butter and golden syrup. Melt. I did this in the microwave, 2 x 60 seconds on high, stirring in between each minute. Place the digestive biscuits in a plastic bag and bash with a rolling pin to crush them. Stir the digestives into the chocolate mixture. Now wait a minute or two before you add one bag of the Aero bubbles, to stop them melting. Press this mixture into the lined tin with a wooden spoon. Melt the remaining 300 g of milk chocolate and pour over the top to fill in any gaps and smooth it over. Chill in the fridge until set. Melt the green candy melt buttons and pour over the top, smoothing it over quickly. Cut the second bag of Aero bubbles in half and scatter over the top to decorate, then press down lightly so they stick to the green layer. Chill again until set. Cut into pieces and serve! Prep time given does not include the time for chilling in the fridge. Oh you know how to seriously tempt someone. 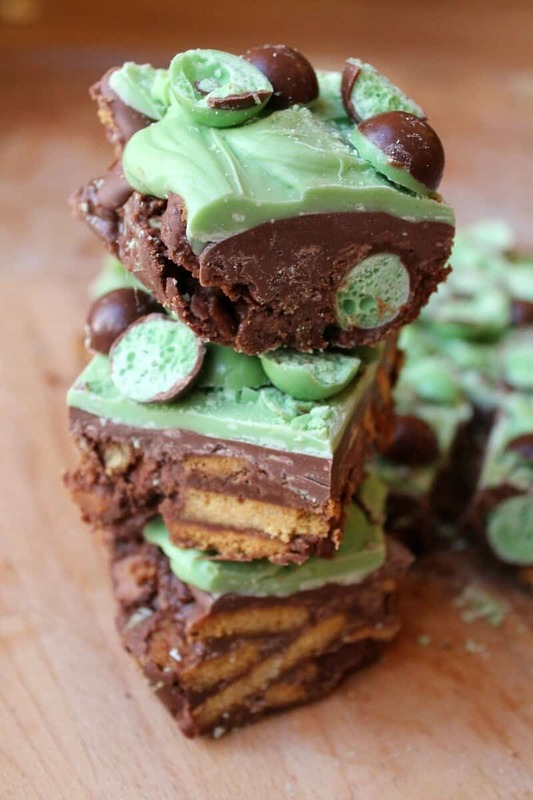 Mint chocolate and tiffin are two of my favourite things. I know have serious cravings and it’s only breakfast time. Fab video BTW. Thanks for sharing with #WeShouldCocoa. I may have missed it, but I couldn’t see a link in your post? Have also pinned to the We Should Cocoa board. Thanks Choclette! Video is a new thing for me and it takes forever to do, is fun though. 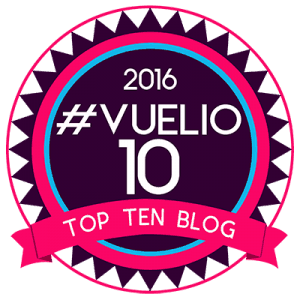 Sorry I forgot to update the post, will do so ASAP! 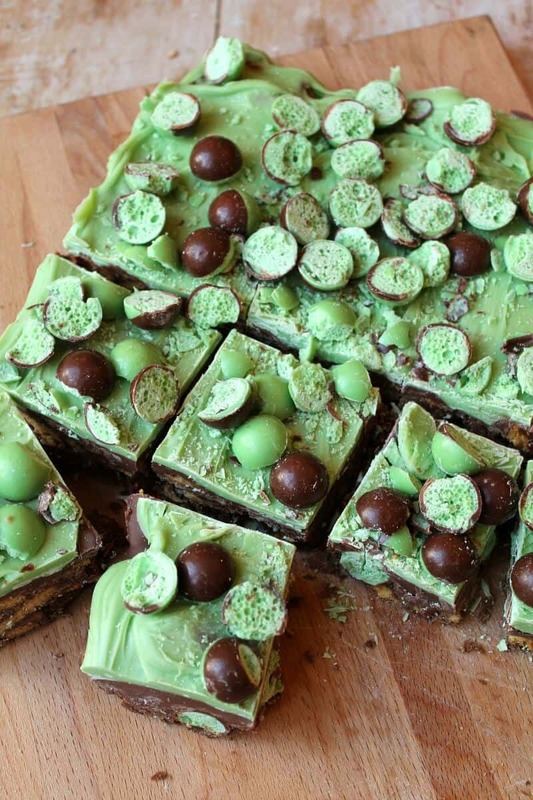 So excited to try this cake for my partners birthday as he is a mint aero addict! Just wanted to check with the smaller version.